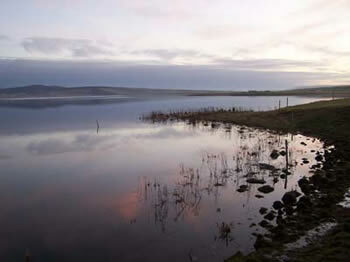 The self-catering lodges are situated in a private, rural location with stunning views of the Harray loch and the West mainland. It is the ideal location to unwind from the busy lives that we all live and spend some precious quality time together. The Lodges are finished to a very high standard in calming relaxing colours, there are 2 bedrooms in each unit one bedroom with a King or double bed and an en suite, and one bedroom with a super king, all are luxurious beds with crisp bed linen. The main bathroom in each has a double ended bath and ample fluffy towels and bath robes. As we all live busy, stressful lives, we completely understand the need to get away and catch up with yourselves and we aim to give you just that. 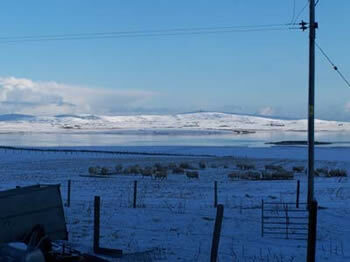 You can be completely alone for your break here and read, watch TV or just relax and enjoy the view or you can spend your time walking the farm or exploring Orkney. Both Stromness and Kirkwall have lots of small boutique shops, selling locally made high quality Jewellery, Clothes, Paintings etc. There are coffee shops nearby and a couple of local therapists who will provide treatments of Reiki, Reflexology and Massage in the Lodges. Whatever you decide to do we want to give you a peaceful haven to return to in the evening and enjoy a little luxury, you will undoubtedly go away feeling relaxed and energised.